Discussion in 'New Members' started by mdw5, Sep 11, 2010. Well, here's the first post. I almost feel I owe it to you since I've been lurking for two months looking at all your awesome trucks while researching for the right wheels and tread for my new 2010 Taco. BTW, thanks. 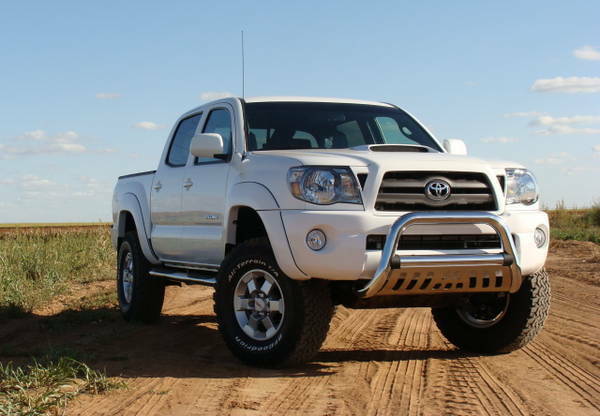 So, here's the new truck with it's toytec 3" lift and 285/75R16's on FJ Cruiser (2008) TRD Alloys. Looks sick! I have those same wheels and love them! looks rad paint them black or powder coat them! looks good! Looks sweet, what kind of bar on front, Westin? Welcome ! from another nOOb. Looks like we signed up at almost the same time (local times), and have the same story (lurking) but you have used the time more productively. damn! i love the grilles on the 2010 Tacomas! I'm thinking of doing the stock grill work (center) in white..... any thoughts?